At eCasa we stock a diverse range of glassware, ceramics, childrens toys, decor items, furniture, soft furnishings, kitchenware, tableware, prints, jewellery, clothing and chalk paint. Mostly we source from artisans working in the regions of Europe. Our European suppliers include Gien, Ceramique du Lussan, Miho, Sabre, Reiss, Melin Tregwynt, Alex Begg, Sophie Digard, Teixidors, Texteis Iris, Charvet Editions, Au Bain Marie, Fragonard and Hale Mercantile Co . Find out more about the story behind these beautiful in store items below. Two centuries of craftsmanship go into the making of this premium quality Faïence. The Gien Faïencerie was established in 1821 in the small French town of Gien on the Loire River. Its founder was Thomas Hall, an Englishman eager to promote and expand fine English faïence in France. Faience or faïence is the conventional name in English for fine tin-glazed pottery on a delicate pale buff earthenware body. Before the Gien Faïencerie was founded, Thomas Hall was involved with the Montereau Faïencerie. He then moved on to revive the Pont aux Choux Faïencerie in Paris. It produced sophisticated pieces of Faïencerie which had a resemblance to silverware. He finally settled on a location in Gien with all the necessary materials near by. Sand and water from river was used to make clay paste. The wood from Sologne forest was used to stoke the kilns. It had the added advantage of being near the Loire River which was the main means of transport up until the mid 19th century. The Gien Faïencerie today still controls the entire process of making its goods, from sourcing raw materials to make clay paste and slip, to turning out the finished product. The Gien Collections are an array of stunning colors and shapes, with 50 different patterns and over 3000 items, ranging from plates to unique hand-painted pieces. Patterns and shapes are both old and new. They are created from archived and contemporary design ideas by prominent artists. Gien collections bring a unique elegance into the everyday of domestic life, on your table. After studying ceramics, Heidi Caillard moved from Switzerland and settled in a village called Blauzac near Uzes. In 1971, she and her husband bought a falling down farmhouse within the picturesque walled medieval village of Lussan in Provence. Les Ceramiques de Lussan was created in 1974 and the rest is history. Her son has managed the small family business since 1994 from Lussan. All Les Ceramiques de Lussan ceramics are created by hand and are glazed to exacting standards. The colourful ceramic Guineafowl, affectionately known as the "fowl of Lussan" are still made using Heidi's original designs. Each piece is much more than just a decorative object, they are highly collectable works of art. Miho started as a textile business more than 60 years ago. Michele Pianezzain is part of the third generation of the family working in the family company. He had a bold idea to bring something unpredictable to the market. The first collection of home accessories was born. The range was launched with flat packed eco-friendly trophies and decorative birdhouses in an eye-catching packaging. Year after year the range has grown and so has the number of fans and followers. The ambitious goal to create unexpected things was set in motion. The company is nestled in a quiet green village in Northern Italy, the ideal place to create new and unexpected products. Michele is supported by a close-knit creative team, and by the other family members each bringing unique skills and sharing the Miho Unexpected Things’ philosophy. Sabre is about trendy cutlery and colorful dinnerware. There are many combinations to mix and match so you can let your imagination go wild! The brand was born out of a conviction that it was possible to marry function with form and modernity with tradition. Each item carries a sense of historical design and contemporary artistic freedom, using colours, patterns and a mix of new materials. Sabre transforms the table allowing the use of cutlery and porcelain in infinite number of combinations. It is up to each and everyone to pick their palette of colours in order to turn their table into a unique experience. 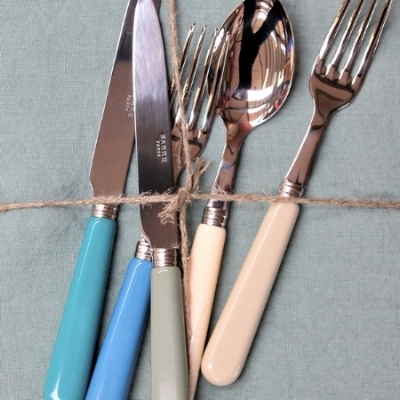 Bring some serious Parisian style to your table using this brand of iconic cutlery and dinnerware from Sabre. This brand blends simplicity and innovation into a contemporary style, creating a charm of its own. Enamelware not only looks good but is good for you. It is claimed to be the best kitchenware for healthy cooking because the food retains natural flavour. The extremely smooth surface of enamel has proven antibacterial properties. Cooking with enamel is also recommended if nickel allergies are an issue. This company has a rich tradition dating back to the year 1550. It is in that year the original pan forge was built near Ybbsitz, in the Lower Austrian Mostviertel region. Riess claims to be now the only kitchen utensil manufacturer left in Austria. The manufacture of high-quality porcelain enamel kitchenware began here in 1922. The classic Riess pots made between 1920 and 1960, finished in white, pastel, black and brown have become timeless cult objects popular worldwide. In 1975, the Austrian design icon Carl Auböck created a striped, round-bottomed pot for Riess. In 2005, pop artist Mel Ramos and designer Tom Dixon worked at Riess. The limited Edition Polkapots range was developed in 2006 with the Austrian design team, Polka. Today, Julian Riess, Friedrich Riess and Susanne Riess are the ninth generation of the family to work in the company. This popular brand is now available in many countries outside Europe, including the USA, Australia, New Zealand, Korea and Japan. Melin Tregwynt is a small white washed woollen mill situated in a remote wooded valley on the Pembrokeshire coast in Wales. Back in the 17th Century it was a corn mill. Later in the 19th Century it was converted to a woollen mill where local farmers would bring their fleeces to be spun into yarn and woven into sturdy Welsh wool blankets. The mill was powered by water from the local stream. The water wheel dates back to the 19th century and is uniquely located inside the building. The large iron overshot wheel drove hammers that beat the woven cloth to clean and soften it. Later the water wheel drove leather belts that powered the carding engines and looms. This equipment has been preserved in the old section of the mill. Through wars, recessions and the passing of time, the looms have continued to produce fabrics that are useful, simple, high quality and timeless. Henry Griffiths and his family have worked the mill since 1912. 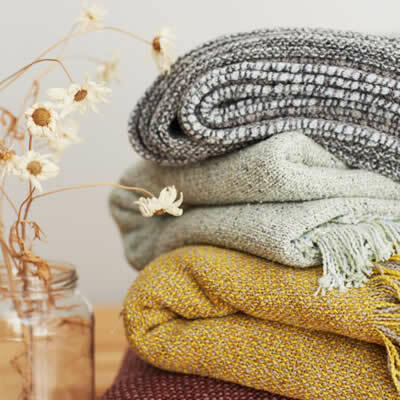 The mill employs over 30 people making blankets, throws and cushions. The unique fabrics are used in upholstery, a simple stylish clothing range, accessories and bags. Eifion and Amanda Griffiths have been running the Mill since 1986. The tradition of Welsh weaving is kept alive at Melin Tregwyntwith with the skills and knowledge of all the staff, both past and present. Sophie Digard takes crochet to another level. Her hand made work is exquisite, unique and very collectable. She uses the most labour intensive techniques to create her intricate pieces from natural materials including fine wool, mohair, velvet, and linen. She is a Parisian knitwear designer and a colorist who began her enterprise in 1999. She has fibers made and dyed to her specifications in France, then shipped to her workshop in Madagascar where they are hand crocheted, knitted and embroidered into unique works of art. There are hundreds of designs and color palettes to choose from. Inspired by the infinite variation of natural elements, Sophie Digard creations are timeless. These scarves, necklaces, brooches, bags, baby clothes and blankets are heirloom quality pieces that have long been treasured by clients and collectors around the world. Teixidors create unique, hand made unrepeatable products using the highest quality materials. This is not a romantic utopian vision but a work philosophy with a focus on singularity and beauty of the unique. Sustainability is more than just an environmental concern. It is a broader global concept that involves social issues like equal integration and responsible consumerism. Since its foundation in 1983, Teixidors has been a cooperative with a clear social agenda geared towards improving economic independence and social integration for people with learning difficulties. The products are designed to be timeless. Handcrafted work and respect for materials form the basis of the products. The use of classic wool looms and the best raw materials are another part of the story. Teixidors goes a step further and actively participates in initiatives that strive to achieve a better future from an environmental and social perspective. This is the core of the work, a recipe that combines tradition with a vision of the future. Texteis Iris are makers of exquisite household linen for the table, bedroom and bathroom. The use of embroidery adds another dimension to the range. The company is a linen specialist within the tradition of Portuguese damask. The colourful range is imbued with reflections of times past. The business is located in the industrial town of Maia in Portugal which is noted for its textile production. Texteis Iris have been producing linen here for over three decades. To help create their seemingly timeless designs Texteis, Iris have gone back in time to resurrect the historical Jaquard weaving technique. This technique originated in the1700's and is regarded as probably one of the most important weaving innovations. It made possible the automatic production of unlimited varieties of patterns and designs. Combining these irresistible patterns with the natural lightness and smoothness of linen has created a product of great refinement and quality. Armentières in Northern France, has been known as the "city of the fabric" since the middle ages. Charvet has been in production here for more than a century. Originally Charvet produced industrial fabrics for use in worker’s clothing, tarpaulins, awnings and naval jackets. Flax is grown extensively in Flanders, so at the beginning of the 20th century the company expanded into weaving linen. They now used their weaving expertise to produce linen for the home - table cloths, tea towel, towels, bedding, curtains, aprons, cushions and accessories. These products have the feeling of being imbued with history, unchanged since women of France filled their wardrobe with linens to last a lifetime. Linen can claim a place in history. It is the oldest fabric in the world, dating back to Egyptian times around the fourth millennium BC, when the Nile Valley was a center of production. It’s origins are attributed to the Goddess Isis, whose priests only wore white linen as a symbol of purity. The pharaohs also wore linen and it was used in mummification. A few centuries later, the Romans moved linen into the home, where it has remained ever since. Flax cultivation is one of the most ecological in the world, a renewable, recyclable and biodegradable natural fiber. The original concept for the store was to display antiques and contemporary tableware, embroidered linen and gastronomic books. These elements created a sense of marrying cultural heritage and modernity through the art of entertaining. Aude Clément had previously studied architecture at Beaux Art and Camondo School. She then became a journalist, working for prestigious magazines like Figaro magazine, Gault et Millau, Nouvel Economiste, Cosmopolitan and Lui. Around this time she decided to design and curate the objects she needed to illustrate her articles. This is where it all started in 1977. Pieces were created in the hand painted tradition with themes inspired by nature, mountains and the hunt. With her original creations you’ll find rigorous aestheticism and quality production with a reference to French culture and style. These are the ingredients that make design for the table part of a refined life style. In 1987, she opened a 600m2 store located between the Hotel Crillon and Hermes where she featured artists like Cindy Sherman, Ettore Sottsass, Richard Meier, Franck Evennou. The store featured Memphis furniture displayed with a remarkable selection of tableware. Today, Au Bain Marie has two locations on the Paris left bank. After working as an engineer, her son César Clément has joined Au Bain Marie to further develop and promote the collections in France and around the world. It was shortly before the First World War, entrepreneur Eugène Fuchs set up his own perfumery to sell directly to the tourists beginning to flock to the French Rivera. This was somewhat of a novel concept at the time. Parfumerie Fragonard was opened in 1926. Eugène Fuchs chose to name it after the famous Grasse born painter, Jean-Honoré Fragonard (1732-1806). This was partly as a tribute to the town of Grasse and also to the refinement of 18th-century arts. The name expressed his desire to run his business in accordance with traditions. This spirit has been continued by the three succeeding generations who have run and are still running the company. New production plants and sales outlets have opened in Grasse, Eze and also Paris. Under the management of Jean-Francois Costa the Parfumerie Fragonard went through a rapid expansion and modernization phase. He was an avid art collector throughout the 1970's. He also amassed a large and unique collection of antique perfume related items that is on display in the local Museum. Jean-François Costa's daughters, Agnès and Françoise now manage the perfumery's future. They are focused on continuing to build the company and adapting it to current market trends. The Irish Times once dubbed her "the Queen of paint" Annie Sloan has lead the decorative painting revolution over the last three decades and has become recognized as one of the world's most respected experts in paint and colour. Early in her career she made a cross over from the fine arts into the decorative arts. Her contagious enthusiasm for decorative painting has enthused her to write over 26 books on the subject. She loves sharing her passion and inspiring professionals and the not so professional to be creative and adventurous with her paints and colours. Initially she wanted to create a decorative paint range that was immediate and allowed her to be direct and spontaneous. She had three young boys under 7 at the time, so she had little time to decorate. She wanted a fast turn around – paint in the morning, then wax and put it back in position by the afternoon. What’s more, she wanted to develop a paint that could go on more or less anything – old and new wood, metal, plastic, cement, bricks, etc. – all with no priming, no sanding, no preparation needed. Her products are available in 50 countries around the world and now more locally at eCasa in Daylesford. Founded in 1902 by Blaise (the Wolf) Dozorme, Claude Dozorme is a brand that reflects the ancient but constantly re-invented family tradition of knife-making. Claude Dozorme is dedicated to producing knives that respect tradition while reflecting modern lifestyles. All Claude Dozorme knives are made in the Auvergne and each one is hand-crafted and finished. eCasa carries a selection of Claude Dozorme’s traditional pocket knives as well as a broader selection of tableware including cheese knives and services, bread knives, carving knives & sets, oyster knives and cork screws. The Hale Mercantile Company manufacture using individually dyed fine linen yarns to create a true luxury linen range. Our yarns are spun from premium grade flax sourced from France and Belgium. Designed to be relaxed in nature and truly easy care, our entire range is grown, spun, dyed, woven and sewn in Europe. Our approach to our linen bedding and household linen is simple, it should always look beautiful with minimal care. eCasa carry the bed linen range which includes duvet covers, sheets, pillow cases, blankets, throws & cushions. With each wash, our linen becomes more desirable and softer offering a unique sleeping experience. We also stock the table linen range including tablecloths, napkins, kitchen towels for around the home.